How do you graph a positive externality? An externality occurs when a third party (someone other than the buyer or seller) is affected by a market transaction. This is known as a market failure. Externalities can be positive or negative. 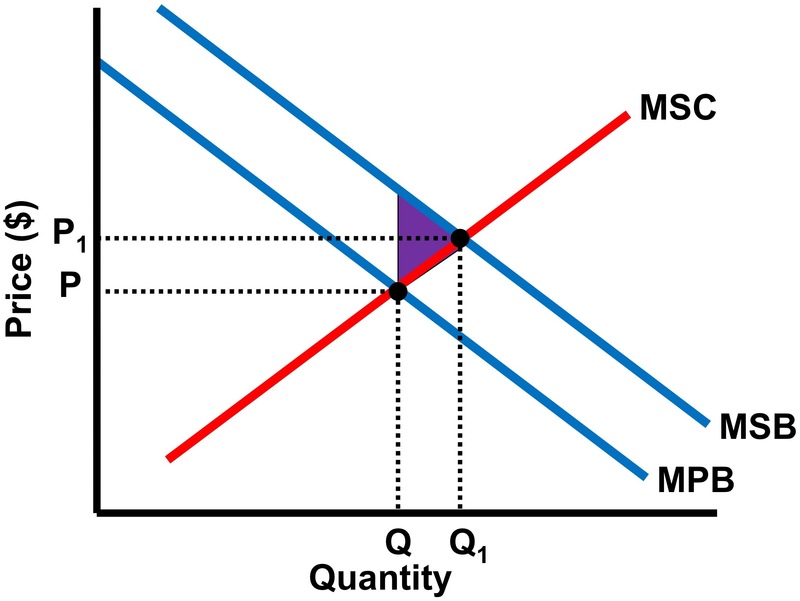 A positive externality occurs when the marginal social benefit (MSB) is greater than the marginal social cost (MSC). Society is benefitting from the production of the good. However, there is a misallocation of economic resources and deadweight loss. Markets underproduce goods that generate positive externalities. The No Bull Review graph below illustrates a good that creates positive externalities (MSB>MSC). The area of deadweight loss (inefficiency) is the purple triangle. P1 and Q1 is socially optimal, however the market generates a price of P and quantity of Q. Society is getting too little of the good at too low of a price. Disclaimers: MrMedico.info (2006-2018) is independently operated and is not directly affiliated with PortNet, the official website of the Port Washington Union Free School District. Students in Mr. Medico's classes are always offered free content for any Mr. Medico product advertised on this site. AP® is a trademark registered by the College Board, which was not involved in the production of, and does not endorse, this product.